Today we will have a rare glimpse into one of the last remaining wild places in the Eastern United States, Cumberland Island, a 18 mile long island just off the coast of Southern Georgia, a semi-tropical eden of endangered wildlife and pristine ancient forests that has been protected as a wilderness area since 1982. In addition to loggerhead turtles and wild horses, it is home to Carol Ruckdeschel, subject of the new biography Untamed: the wildest woman in America and the fight for Cumberland Island. Today we are speaking with the author of that book, Will Harlan, the editor in chief of Blue Ridge Outdoors Magazine and award-winning journalist. Will was a park ranger on Cumberland Island for nearly twenty years. 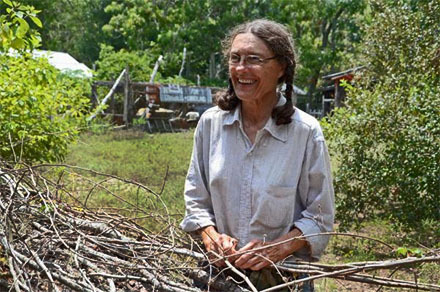 He initially dreaded crossing paths with this legendary witch of the wilderness, but the real Carol Ruckdeschel turned out to be a distinguished biologist, tireless steward of Cumberland island, and one of the most wildly fascinating people in America.